The use of PEAK, a Kansas economic development incentive program, varies widely among counties. Johnson County: 135 projects, 17,643 new or retained jobs, $36,085,527 cumulative annual benefits. 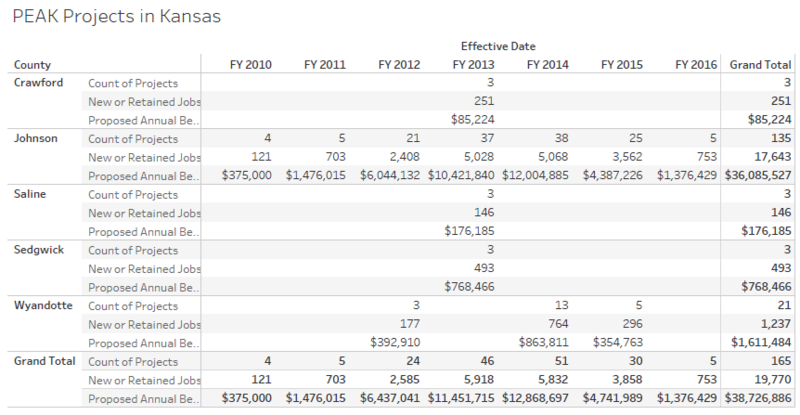 Sedgwick County: 8 projects, 1,113 new or retained jobs, $1,858,516 cumulative annual benefits. According to the U.S. Census Bureau American Fact Finder, the 2016 population of Sedgwick County was 511,995. Johnson County population was 584,451. So Johnson County has 1.14 times the population of Sedgwick County, but it receives some 16 to 19 times the PEAK benefits as Sedgwick County. Of note, this data is available on Kanview, the state’s data download portal. The data is from a spreadsheet compiled in August 2015. It contains data through fiscal year 2015, which ended on June 30, 2015. Upon my inquiry, it appears no similar data compilations were created in August 2016 or August 2017. I have asked for the data and it is taking some time to prepare it, which leads us to wonder how diligently the state collects data regarding economic development programs. You can access an interactive visualization of PEAK data here.